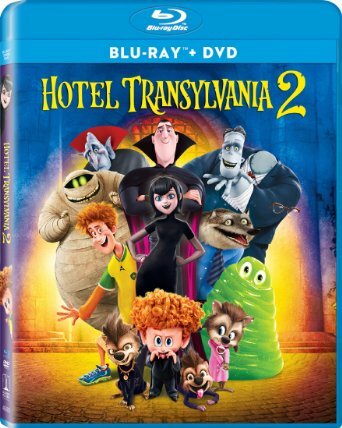 This past January Sony Pictures Animation released its family friendly flick Hotel Transylvania 2 on DVD and Blu-ray. The movie, which is the follow-up to Adam Sandler’s hit 2012 movie Hotel Transylvania pales in comparison to that movie even no that it has been released on DVD and Blu-ray. It isn’t a total loss. However it is anything but a success, too. The movie’s story is one of its few saving graces. It is actually a natural progression from the story behind Hotel Transylvania. At the same time it isn’t without its own glaring problem. The movie’s pacing is just as much of a mixed bag. That will be discussed later. Last but not least of note within this movie is the work of the movie’s cast. Sandler and cast mate Selena Gozmez impress once again as Dracula and his daughter Mavis. Sadly Andy Samberg is not as impressive as he reprises the role of Jonathan. Luckily his portrayal is the only one that stands out as being truly underwhelming. Sandler and Gomez both shine in their respective roles. Together with the work of the movie’s writers, their work serves to make Hotel Translyvania 2 a pale shadow of its predecessor that is fun, but yet another forgettable flick that did not need to be made. It shows in the end to be more proof that not every movie nowadays needs a sequel (or a prequel or remake either). Sony Pictures Animation’s Hotel Transylvania 2 is a fun new installment in this franchise. However it isn’t entirely memorable even with its few saving graces. One of those rare saving graces is the movie’s story. Even that isn’t saying much. The story centers once again on Mavis and Dracula’s relationship as father and daughter. The pair’s relationship changes even more here from the series’ first installment as Mavis becomes a mother and Dracula becomes a grandfather. The change happens because Dennis, Mavis and Jonathan’s son, doesn’t immediately show signs of being a vampire. Dracula doesn’t like this so he takes Dennis on a road trip while Mavis and Jonathan go on vacation. The catch is that only he and Jonathan know that the trip is really to try and scare Dennis’ inner vampire out. At the heart of the story is not so much the road trip and the antics of Dracula and his friends but Dracula’s growing realization that times and people have changed. This includes the realization that even his own daughter has changed. She’s not a little girl anymore. Using such a story line is a time honored tradition for filmmakers. So it is anything but new in its use here. And that is in itself a problem for the movie. It leaves one asking did the movie even need to be made? This is asked especially considering how well the series’ first installment was wrapped up. The honest answer here is a decisive no. It did not need to be made. The previous movie could easily have been left by itself. But someone decided that it should and that it should use such a familiar story line. Even with that in mind it still manages to entertain audiences in its use here. While the time honored story line does manage to keep audiences entertained in the case of this movie, the story’s pacing counters that entertainment and ends up bogging down the story. The story at the center of Hotel Transylvania 2 is an entertaining work. This is the case even though the story is anything but original. Even as surprisingly entertaining as it proves to be the story does have one major con—its pacing. The story’s pacing is all over the place throughout the course of the movie. It starts off almost right where Hotel Transylvania left off. Mavis and Jonathan are getting married. They then head off on their honeymoon. From there, the movie jumps to the couple returning to the hotel with their announcement about Mavis’ pregnancy. Things don’t get any better from there. The story jumps from there to Dennis’ birth and then from one birthday to the next until finally it reaches the days leading up to his fifth birthday. According to the story, that is when Dennis is supposed to show the first signs of being a vampire. This is so problematic because there are no clear transitions from one point to the next throughout all of that time passage. It forces audiences to have to really pay close attention throughout those early potions of the story. Luckily things do finally settle into a stable rhythm from here. The problem is that the pacing doesn’t stay solid from here. Instead of speeding back up the pacing reaches a point at which it feels like it slows down. It slows to the point that older audiences will find themselves checking their watches. It doesn’t get any better from there either. At least it doesn’t until the movie finally ends. By the time it ends, audiences are left feeling like the movie’s roughly ninety-minute run time is about half an hour longer or more. Even as problematic as the movie’s unstable pacing proves to be to the movie’s presentation, it is made at least somewhat bearable thanks to the work of the movie’s two main stars, Adam Sandler and Selena Gomez. The pacing of Hotel Transylvania 2’s story is a hugely problematic issue for the movie. That is because of how inconsistent it is from beginning to end. It doesn’t ruin the movie’s story. But it does weigh it down quite noticeably, though. Now as much of a problem as the story’s pacing proves to be for the movie in the bigger picture, it is countered by co-stars Adam Sandler and Selena Gomez. This is especially the case at the points at which the pair directly interact with one another. This includes not only the pair’s early interactions in the movie’s early minutes but also the pair’s interaction after Mavis discovers via YouTube what her father was really doing with her son. Of course that moment is just as interesting. Even though Gomez obviously isn’t a parent she successfully captures the fire that any mother would have when her child/children is/are in danger. Her determination to get to Dennis will have audiences of all ages laughing and cheering her on, too. The same can be said of her emotion in confronting her father about his lies. It’s just too bad that Andy Samberg can’t be so openly applauded. Given Samberg was just playing the part of Jonathan. But his character is just as forgettable as is his portrayal of Jonathan. Thankfully Sandler’s other cast mates pick up Samberg’s slack as they join Dracula on his road trip. Steve Buscemi and Kevin James are a laugh riot as Wayne and Frankenstein respectively as a pair of supposedly scary monsters who are more mundane than monstrous. David Spade is entertaining in his own right as Griffin the invisible man. And Keegan –Michael Key is just as funny as Murray the mummy. Audiences will love watching him try to be scary, only to throw out his back time and again. It is a running gag. But it never gets old at any point. Key never overdoes it in these moments. Because he doesn’t he remains just as funny the first time he pulls the bit as the last. Whether through Key’s expert comic timing, Buscemi and James’ unassuming comic portrayals of their characters, or even for the work of Sandler and Gomez, the work of Hotel Transylvania 2’s voice cast by and large proves to be one more of this movie’s saving graces. Together with the movie’s story the two elements combine to make Hotel Transylvania 2 a movie that while fun still proves to be a relatively forgettable story. 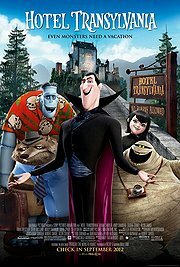 Sony Pictures Animation’s latest installment in the Hotel Transylvania franchise is not the series’ worst installment. But considering its cons set against its far fewer pros, it is anything but a standout showing. Rather it proves through its all too familiar story line and its problematic pacing to be more forgettable than fun. Its only real saving grace is the work of its voice cast. Adam Sandler and Selena Gomez shine again as Dracula and his daughter Mavis. David Spade, Kevin James, and Steve Buscemi are entertaining in their own right as Dracula’s monster friends. Andy Samberg is the only real disappointment among the movie’s voice cast. Yes, Jonathan is supposed to be a somewhat airheaded California skater hippie type figure. And yes, Samberg really plays up the part. But he plays it up perhaps too much. Thankfully the rest of his cast mates make up for that in their own portrayals, in turn serving collectively as the movie’s only real saving grace. Keeping this in mind even with a story that is mildly entertaining at best and relatively enjoyable acting, Hotel Transylvania 2 proves in the end to be a pale shadow of its predecessor and a movie that is more forgettable than fun. It is available now in stores and online on DVD and Blu-ray + DVD combo pack. Hotel Transylvania is hardly the most memorable of the year’s holiday movies. In its defense, it isn’t the worst, either. One part Monsters, Inc. and one part Mad Monster Party, it has just enough heart and jokes to make it appealing to both parents and children. The heart of the movie comes from the primary storyline in which Dracula (voiced by Adam Sandler) throws a party for his daughter, Mavis (voiced by Selena Gomez—Wizards of Waverly Place). It takes place on the eve of her *ahem* 118th birthday. The thing is that this incarnation of Dracula is like any other parent. He knows that his daughter is an adult. But he’s scared to let her go and cut the leash. This is something to which every parent can relate. Sure, so many movies use this kind of plot. But the execution of the storyline offers enough heart to make it enjoyable for parents even in the twenty-first century.Hotel Transylvania’s primary plot is executed in an original manner. But without its secondary plot, the main story of Dracula learning to let go of his daughter might not have worked so well. That secondary plot is the buddy comedy between Dracula and Jonathan (voiced by fellow SNL alum Andy Samberg). At first the pair is at odds with each other. But thanks to a course of events, they end up becoming close friends. It’s that series of events that will leave both kids and parents laughing and really make the movie worth its hour and a half run time. The dual storylines written into Hotel Transylvania make it an enjoyable movie both for parents and kids. On another level it’s enjoyable in that seeing the collection of classic Universal movie monsters will make parents (and even grandparents) feel nostalgic. At the same time, it serves as a good way to indoctrinate young audiences into the world of classic horror monsters. This combined with the movie’s family friendly storylines makes it a movie that while hardly memorable, is worth at least one watch.